Over the shoulder shot is a filming technique in which a shot is taken in an angle that is gazing onto the character from over a shoulder of a different person with whom the subject is talking to. The back of the person, shoulder and the head is used as a frame the image of the scene. Although this sounds simple a lot of planning needs to go before this shot is taken like which side of the frame should the shoulder occupy and how much it should occupy so that the relevant emotions of the character in focus is shown. This shot is very useful when you need to have the character not focusing into the camera and delivering a dialogue. Having the shoulder of the other person in the frame also intensifies the interaction between the two characters. Maniratnam had used this technique to a great extent in the movie Thalapathy for the interactions between Mamooty and Rajnikanth. It places equal importance between the two characters and also exemplifies a high degree of emotion. Maniratnam had also used this in Nayagan to show Kamal Hassan’s reaction for his grandson’s question “Neenga Nallavara Kettavara” (Are you a good person or a bad person) over the shoulder of the kid. K Balachandar had used this in many of his movies to highlight the emotions in the face of the main character and also to intensify the scene. The following still from Ninaithale Innikum is an example of it. Over the shoulder shot to intensify the interaction between two people. It could simply be used to change the point of perception or to focus the attention on the main character in the scene. 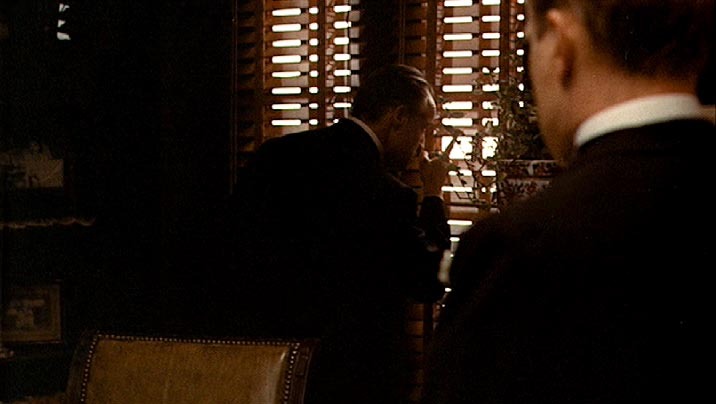 The following scene in the movie God Father is an example of this where over the shoulder shot is used to reinforce the presence of other people in the room and also focus is given more on Don who watches out of the window. The object of focus is in the center of the frame avoiding distractions from the right half enhances the focus on the action of the character. This can also be used for hiding the identity of the character like an unknown person not relevant to the plot talking to the main character or a mysterious person talking whose identity may be revealed later. A simple and ordinary scene can be made interesting through the angle of the shot. The skill of the director and the cinematographer is involved in choosing one from a varied set of options for the camera angle. Over the shoulder shot is definitely a powerful one which has been used very aptly by many great film makers. Next time you watch a movie watch out for the camera angle in which a shot is taken.